There were roadworks at the junction of our lane and the A41 recently; temporary traffic lights were in place for a couple of weeks, and a small army of workmen were beavering away with cables and diggers, “upgrading” the junction. In this case, “upgrading” seems to have involved replacing all the cats eyes with whizzo new electronic versions – with their own light sources (LEDs presumably) and coloured differently (red, green, and blue-white) for different areas of the junction. So now negotiating a turn feels a bit like coming in to land. It’s impressive stuff, but it is allegedly the first junction in the country (the bloke might have said county!) to be equipped like this, so you can’t help feeling that the distraction of admiring the light show might just make the road less safe…. But anyway, as well as re-lighting the place, the rather lovely workmen have also replaced, increased and relocated all the signage, including our brown tourist signs. We’ve had brown signs on the A41 for a decade at least, but the one on the north bound carriageway was placed in a less-than-prominent position, and the southbound sign was mounted on the same poles as several other signs, so got a bit lost amongst the other information. But now we have larger signs, with more concise wording, placed on their own, and in rather better roadside locations than before. It’s all good (as the young folk might say). Back in the late 70’s and early 80’s you couldn’t consider yourself a hip and happening gardener if you didn’t have a conifer bed. Actually, you probably wouldn’t have recognised the need, because there was almost certainly no such thing as “hip and happening” back then – but whatever expression was in use, if you wanted to follow the gardening fashion, conifers were where it was at. Gardening fashion is as fickle as any other of course, and the 80’s enthusiasms for Adrian Bloom, Foggy Bottom, Island beds and and all things conifer were soon cast aside in favour of the 90’s obsessions with decking, blue fencing, architectural planting and Groundforce stylee makeovers. The noughties saw a bit of a hiatus in garden fashion, but Monty Don made a valiant effort to set a trend and revive the fortunes of the conifer when he planted one of the front borders at Berryfields(¹) with them; sadly, it barely got its 15 minutes of fame before Monty crashed and burned from our screens, and Berryfields found itself consigned to TV gardening history. But where Monty failed, the great British weather triumphed – the last couple of winters have despatched an awful lot of the hoped-to-be-hardy plants that were planted in the Groundforce years, and gardeners looking for tougher replacements for their architectural specimens are focusing once again on the charms of the conifer. We’ve always sold conifers here, but they’ve tended to get mixed up in the general melee of the sales areas, and have never been a proper feature on the nursery. But no more! With increased customer interest in them, and National Conifer Week on the horizon, we’ve made some changes – and the Barlow Nurseries conifer department is now open! All our conifers (except the hedging ones) are now grouped together; we’ve increased our stock, and now offer all sorts of shapes and colours, in all sorts of sizes – from smaller plants in 3 lt pots, up to well established 15 lt specimens. So if you’re wondering what to put where that Phormium/Eucalyptus/Ceanothus/Bay/Trachycarpus/Tree fern/etc, etc used to be, we may be able to help! (¹) Berryfields – actually Burmans Farm, Shottery, Stratford-on-Avon – was the TV garden from 2003 – 2008. The first of the autumn tree deliveries arrived this morning. Yep, autumn. Like the football season, it seems to start earlier each year. That’ll keep us busy for a while. It’s a shed! It’s a shed! It’s taken rather longer than we expected it might, but the pile of wood can now be revealed in all its transmogrified glory….as a new sales office! Well, okay, maybe more an alcove than an office, and maybe more a shed with a large hole than either of them, but shelter from the weather for us, customers, and all the sales paraphernalia that seems to accumulate around a till and credit card machine. The first photo looks as if it’s been photoshopped by David Dickinson, but it hasn’t – all the photos were taken within a few minutes of each other – the only difference is that the sun peeped from behind the clouds for the few fractions of a second during which the first picture was taken! High summer is undoubtedly a hiatus in the garden; the mad rush of growth and flowers in spring and early summer are fading in the memory, the plants that delivered that early season glory are enjoying a quiet bit of r & r and concentrating on building reserves for next years display, and the late season flowerers are still coyly waiting in the wings. But your borders don’t have to be lacklustre! We’ve tried especially hard to keep the nursery looking fresh right through the summer this year, and it’s certainly possible to keep a good show of colour going through the season. There are Chrysanthemums, Phlox, Penstemons, Dahlias, Coreopsis, Heleniums, Heliopsis, Echinaceas, and many others to fill the mid-summer hungry gap, and Louise has spent many a happy hour recently playing florist with them in our shade tunnel. And it looks lovely doesn’t it? You don’t often get customers saying “Wow”, but we’ve genuinely had several do so in the last few weeks. And “it’s just like a garden!”. And if that inspires them to take some plants home for their gardens, so much the better! Not being a retailer – in the sense that all we sell is plants – we don’t do Christmas, and we don’t sell Christmas trees. But we do sell trees at Christmas (or thereabouts). In addition to selling container grown trees throughout the year, we also sell bare root trees during their season, roughly November to March, and this means that our first delivery usually arrives in December. So while other garden retailers are marshalling acres of Norway Spruce and Nordman Fir to brighten the nations front rooms, we’re sorting our way through piles of all shapes and sizes of trees to brighten our customers gardens. We love trees, and our tree department is easily our fastest growing (ha!) area. We’ve just completed this years “tree department expansion plan” and created another 80 or so stations to accomodate extra tree stock. Buying bare-root is a very economical way to get trees into your garden. Because they are field grown they are much cheaper to produce (because they need much less TLC than their pot grown cousins) and because they don’t have huge pots of soil or compost permanently attached, their transport costs are much lower. Anybody who arrives at the nursery outside the bare root season and either can’t find a tree they like, or wants one that’s larger, or cheaper, goes into the bare root book, and are then contacted in the autumn to see if we can sort something for them from our bare root suppliers. Orders are processed “live” between November – March, although we try to consolidate deliveries into sensible batch sizes so we can offer the very best prices. We’re very happy to be working in what might otherwise be the “off” season of course, but it must be good for gardeners too – there’s little else to do in the garden in mid-winter and planting a tree is a wonderful excuse to get out there and do something. This unassuming collection of tanalised timber is about to increase our tree display capacity, so we can offer customers an even bigger tree browsing opportunity. We currently have about 250 trees on our sales area; this timber will be used to build an extra 2 aisles, which will allow us to add another 100 or so trees to our display. We’ll use the opportunity to stock the more popular species in depth, and add some more choice and unusual varieities, so we hope we’ll have something to suit most requirements. And what better way could there be for us to spend our time in National Tree Week (which runs from 25 November to December 6 – that’s a week and a half isn’t it?). And as it happens, the first tree delivery of this planting season arrives tomorrow, so we’d better start building! You wanna be a record breaker ? Don’t blame us, it’s the BBC’s pun. ‘Tree Time’ is actually the hour between 11am and midday on December 5th, when the BBC are hoping to establish a world record by getting 1,000,000 trees planted in 60 minutes. The current world tree planting record is held by the Phillipines where over half a million people planted 653,000 trees on 25 August 2006. The BBC has recruited members of the Horticultural Trades Association to help promote the event, and distribute some of the tree seedlings that they have to give away to help hit the target. We’re very happy to be playing our part in this, and have a limited number of free tree seedlings available for anyone who wants to contribute to the record attempt (and of course, to the environment!). All you have to do is formally commit to planting a tree on the BBC breathing places website and then e-mail them a photo of you doing so (with the time and date correctly set on your camera – the boys at Guinness need hard evidence to verify the record!). Then watch the press to see if the record has been broken! The free seedlings available are Hazel, Field Maple, Cherry, Rowan, Hawthorn, and Silver Birch, and around 12 – 18 inches tall. 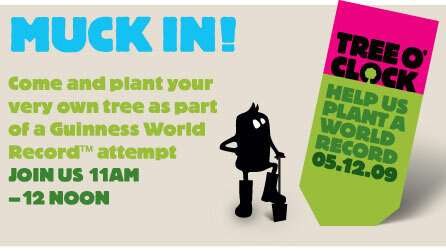 If you prefer to source your own tree(s), of whatever size, that can still be counted towards the record attempt. The free seedlings are available now – first come first served, one seedling per family – so if you want to take part call in to the nursery as soon as you can. Barlow Nurseries joins the establishment! There are a lot of good reasons for a horticultural retailer to be a member of the Horticultural Trades Association but probably the most visible one is the National Garden Gift Voucher scheme. Now sold and accepted here! We’ve always sold our own Barlow Nurseries gift vouchers, but have had to turn away customers who wanted to spend their National vouchers here, and of course, have been unable to sell vouchers to customers who wanted to send them to people in other parts of the country. But that’s all changed – you can now spend your National Garden Gift Vouchers at Barlow Nurseries, and we can sell you vouchers to send to your friends and relatives around the country. With around 2000 garden retailers in the scheme, nobody is ever far away from a spending opportunity! And if you can’t get to the nursery, just give us a call on our order line (07742 367494) and we’ll take a credit / debit card payment, and mail the vouchers to you, or directly to your friends and relatives, in a seasonal greetings card!